2018 was an exciting year for UFC fans, highlighted by some amazing fights between top competitors. To celebrate these fights and the warriors that made them so great, we're hosting a tournament-style Team of the Year (TOTY) event in Ultimate Team. Featuring fresh fighter and move items that can become some of the most powerful pieces of your team, this special event is one you won't want to miss, running January 18 to February 21, 2019. You'll vote weekly in game to determine the 2018 Fight of the Year from a list of eight matchups, and each week the fights with more votes will move up the bracket. As the pairings advance, Upgrade Sets will become available for the associated TOTY fighter and move items. Complete these Sets to earn the next tier of fighter or move item for your Ultimate Team. At the end of the event, only one fight from 2018 will remain, and the two fighters left standing will be featured as TOTY Master items available in an Upgrade Set. 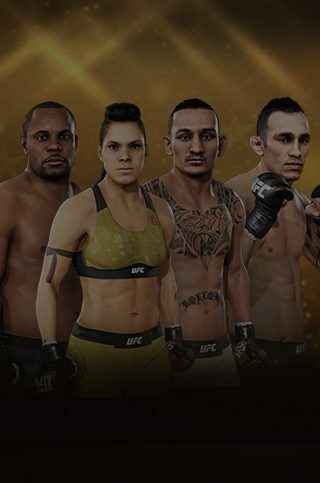 Keep reading to learn all about this unique event taking place in UFC 3 Ultimate Team. 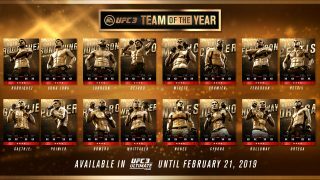 Every fighter involved in the event will have a Gold TOTY Fighter item and TOTY Move item, which can be found in TOTY Packs and TOTY Sets. When a fight moves up the bracket, an Upgrade Set featuring the winning fighters or moves becomes available. These Upgrade Sets can be completed using upgrade tokens, earned by completing TOTY Challenges, or found in TOTY Packs during the event. Complete the Upgrade Set to collect the upgraded fighter or move item. In week one, the two fights with the most votes will move on to the semi-finals, going up against whichever two fights end up making it through the second week. In week three, you'll vote on the final four fights of 2018, culminating in the week four finals. The winner of this final vote will move on to the fifth week, being made available in Ultimate Team Sets as Master items. You can vote using TOTY voting tokens found in TOTY Packs, or earned by completing TOTY Solo Challenges. Open a TOTY Pack in the Ultimate Team store and receive one voting token, then put that token towards a Set that features the matchup you consider to be the best fight of 2018. Be sure to cast your votes before 12:00am on Friday each week before the week's voting window closes. If a fight receives enough votes to move on to the next round, Upgrade Sets for that fight's items will become available. Here are the winning fights for each week, along with the fighter and move items that come with the Upgrade Set. Move items: Elite (4*) items, stats improve to Elite Move item values. Fighter items: Elite (4*) items, stats improve to Elite Fighter item values. Robert Whittaker vs. Yoel Romero 2 edged out Cris Cyborg vs. Amanda Nunes by less than one percent of the vote, so make sure you're completing sets, because every vote counts! With Ferguson vs. Pettis being declared the Fight of the Year, you'll have one week to trade in your tokens and collect your rewards. REQUIRES EA SPORTS UFC 3 FOR APPLICABLE PLATFORM (SOLD SEPARATELY), INTERNET CONNECTION, EA ACCOUNT, AND ALL GAME UPDATES. VOTE TOKENS MUST BE USED BY 12:00 AM FEBRUARY 15. VOTE WINNER UPGRADES MUST BE USED BY 12:00 AM FEBRUARY 22ND.